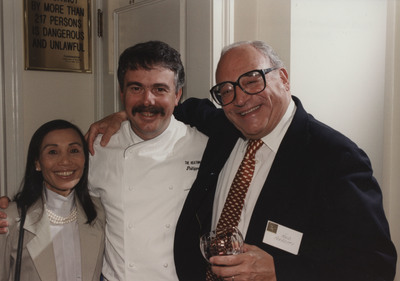 Eileen Yin-FeiLo, chef Phillippe Boulot, and Fred Ferretti pose for a photo at the Erath Vineyards 25th anniversary celebration at The Mark Hotel, New York City. Hinsdale, Lane, "Erath Vineyards 25th Anniversary 07" (1997). Erath Winery Photos. Image. Submission 80.